This Japanese concept revolves around a deceptively simple practice: quietly walking and exploring, with a mind deliberately intent on – and all senses keenly open to – every sound, scent, color and “feel” of the forest, in all its buzzing bio-diversity. With forest bathing (and the increasingly expert-led “forest therapy,” or shinrin-ryoho), mindfulness meets nature, and the goal is to “bathe” every physical cell and your entire psyche in the forest’s essence. No power hiking needed here; you just wander slowly, breathe deeply and mindfully, and stop and experience whatever catches your soul – whether drinking in the fragrance of that little wildflower, or really feeling the texture of that birch bark. Poetic? Pleasurable? Yes. But it’s the science behind the practice that’s now taking forest bathing global, as a growing mountain of evidence indicates there’s strong medicine for human bodies and brains that a forest uniquely dispenses. Forest therapy studies have been led by Japan, whose government funded $4 million in research from 2004-2013. Today, the research database PubMed returns 100+ studies on the health impact of forest bathing, including studies indicating that it significantly lowers blood pressure (-1.4 percent), heart rate (-5.8 percent), cortisol levels (-12.4 percent) and sympathetic nerve activity (-7 percent) compared with city walks, while also alleviating stress and depression.1 The most provocative of these studies conclude that exposure to phytoncides, the airborne, aromatic chemicals/oils emitted by many trees, have a long-lasting impact on people’s immune system markers, boosting natural killer (NK) cells and anticancer proteins by 40 percent. It’s research like this that has made forest bathing a pillar of preventative medicine in Japan, and increasingly common in places like Korea (where it’s called “salim yok”), Taiwan and Finland. It may be hard to grasp what a serious, widespread practice this is in Japan, where a quarter of the population partakes in forest bathing and millions visit the 55+ official Forest Therapy Trails annually, prompting a plan to designate an additional 50 such sites within 10 years. Visitors to Japanese Forest Therapy Trails report that they’re asked to have their blood pressure and other biometrics taken pre- and post-“bathing,” in the quest for ever-more data. Major media worldwide2 have been ramping upcoverage of the fascinating medical evidence. And in an era of unprecedented urbanization and digitization (with the average person now “bathing” his face seven hours a day in the glow of a screen), we humans are in the throes of a forest-deprivation crisis. The convergence of these two trends – growing awareness of the medical benefits of time spend in forests, and alienation from this essential, yet increasingly exotic, human experience – will drive demand for forest bathing experiences in the year (and years) ahead. You could argue that, among wellness approaches, there has perhaps been no greater disconnect between the positive medical research and how much time-in-nature has actually been “prescribed.” A study from the Universities of Kansas and Utah (U.S.) found that three days of wilderness hiking improved scores on creativity tests by 50 percent. Meanwhile, a large recent study from the University of Michigan and Edge Hill University (U.K.) found that nature walks significantly combat stress and depression. It’s no surprise that densely urban places like Japan and Korea were first to rush to forest bathing, but as the world undergoes the most intense urbanization in history, we’re all in a sense “turning Japanese.” Fifty-four percent of us now live in urban areas, and that number will rise to 66 percent by 2050.3 In 1990 there were only 10 mega-cities (10 million+ people); now there are 28, and by 2030 there will be 41. City living puts nature and simplicity at a higher premium, which is why so many more Chinese people are taking “Blue Sky Holidays,” to escape the mega-city pollution and get into nature. Forests now cover 31 percent of the planet’s land area, and while over half of the Earth’s forests have been destroyed in the last 10,000 years, the majority fell in the last 50.4 A University of Maryland (U.S.) and Google Earth5 collaboration reveals that roughly 50,000 square miles of forest are erased every year – the equivalent of 36 football fields a minute. Japan took the lead with the launch if its Association of Therapeutic Effects of Forests in 2004, but today more and more nations are stepping up development and promotion. A government-supported taskforce on forests and human health launched in Finland in 2007. Things went global when the International Society of Nature and Forest Medicine (INFOM) debuted in 2011 and went on to establish a North American chapter established in 2013. Korea is investing $140 million in a new National Forest Therapy Center,6 slated to open soon. And more government bodies and wildlife organizations are now yoking their forest offerings to the practice of, and science behind, forest bathing, whether it’s the New York State Department of Environmental Conservation or the Canadian Wildlife Federation. Increasingly, forest bathing is evolving into professionalized “forest therapy,” involving certified specialists and specially designed trails. In Japan, forest therapy “bases” are selected by researchers, with forest therapy led by licensed professionals. A “Health from the Forest” project (through a partnership with the Finnish Forest Research Institute) has created special “engagement-based” trails in Finland, France, Luxembourg and Sweden. In the U.S., the Association of Nature and Forest Therapy Guides & Programs provides training and certification around the country, and they even offer Forest Therapy Wellness Retreats that combine a spa or hot springs resort stay. What was once a “walk in the woods” will continue to become more evidence-based and expert-led. An insightful Slate article explores how more doctors are now prescribing time in parks/forests, just as they did in the 19th century when unwell people were packed off to health resorts in the woodsy Swiss Alps or Adirondacks, before the rise of the pharmaceutical era. The U.S. pioneer in the “prescribing nature” movement is Dr. Robert Zarr, whose Park RX program, started in 2013 by multiple government agencies, has written hundreds of prescriptions for young people with conditions like asthma and obesity to get out and move in nature. Park RX is just one of a growing number of global “nature prescription” initiatives. New Zealand’s “Green Prescriptions,” used by over 80 percent of the nation’s general practitioners,involves writing a nature prescription (“GRx”) and then supporting patients with follow-up phone calls and/or meetings. In Wales, a Forestry Commission program, Actif Woods, has doctors prescribing woodland walks to combat conditions like heart problems and depression. And in an interesting global development, INFOM approved certifying “Physicians in Forest Medicine” in 2014. In Japan, forest bathing is becoming a staple of mainstream medicine. Companies are starting to include forest therapy in healthcare benefits. Forest therapy bases link to both hospitals and hot springs/medical spa establishments, with many offering free wellness check-ups right in the forest. And last year saw the launch of a “Walking Forest Therapy Roads® with a Doctor” program, giving people an opportunity to see how even one dose of forest therapy impacts their stress levels and NK cells. In a related trend, forest essential oils with phytoncides will make their way into more spa experiences and products. Spas in Korean cities like Metro Spa Cabin (Seoul) and Spa Land (Busan) simulate forest bathing with saunas infused with negative oxygen ions and phytoncides. And we’ll see more technology aimed at bringing the forest indoors, such as the “phytoncide generating system” developed by Korea’s BlueN to infuse office spaces, hospitals, homes, hotels, etc. There are too many hot springs hotels and spas that integrate “forest bathing” across Japan, Korea, Taiwan, China and countries in woodsy Northern Europe to name. Now forest bathing programs are not only moving West, they’re appearing on menus at several high-profile destinations, with properties putting their own innovative spins on the concept. Blackberry Farm, a 30-year-old resort gem in Tennessee’s Smoky Mountains (U.S.), just opened Wellhouse, a comprehensive spa/wellness center,with a specific focus on Japanese forest bathing. Its new “Deep Healing Woods” activities (from inforest yoga and meditation to endurance hikes) all end at an platform deep in the woods, and the spa uses a rich harvest of forest-found, seasonal flowers and herbs, etc. Award-winning Woodloch Lodge in Pennsylvania’s Pocono Mountains (U.S.) has added a Forest Bathing program, with walks led by a master herbalist teaching guests the shinrin-roku way: mindful contemplation, deep-breathing and foraging for edible plants/remedies. Stowe Mountain Lodge, a ski-and-wellness landmark in Vermont (U.S.), has added a “Wei to Wellness” package, starring a “Mindful Snowshoe Tour” based on Japanese forest-bathing principles. In forest-dense Canada, the luxury wilderness resort Trout Point Lodge in Nova Scotia has made forest bathing a centerpiece. In the U.K., Lake District country house/spa resort Armathwaite Hall has begun a “Forest Bathing Spa Package” led by their yoga master. Austria’s Hotel Forsthofgut’s waldSPA (forest spa) (Leogang, the Alps) lays claim to being the first “wellness center forest” in Europe, with guided forest bathing and barefoot forest walking paths. In 2016 look for the high-eco-design Chedi Tomakomai (a GMH property), set in lush forest on the Japanese island of Hokkaido, to make guided forest therapy and hot springs the focus of its wellness center – another sign that “forest bathing” is moving into serious luxe resorts. 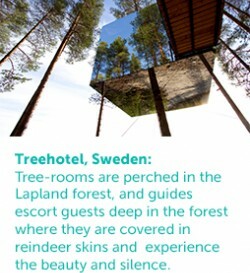 The “Earthing” trend from the Spafinder Wellness 2013 Trend Report focused on the innovative approaches spas and wellness retreats were taking to immerse guests in nature. Just two short years later, it would take a thick book to chronicle all the creative ways properties, treatments and fitness activities are delving deeper into nature. As part of this ongoing trend, people are becoming hungrier for intimate, quirky eco-wellness-wilderness lodges rather than the “inward-turned” and amenity-driven spa resorts of yore. The new luxury: using a suspension bridge to reach your rustic jungle tree house, where the electricity may flicker but you have 24/7 eye contact with exotic wildlife species – an experience found at Peru’s spa-nature resort Inkaterra Reserva Amazonica. More jaw-dropping tree house, igloo, and other ingenious “nature-pod” rooms and spas seamlessly, sustainably set in forests and jungles. 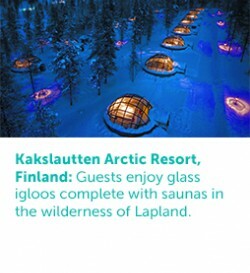 Examples include Finland’s Kakslautten Arctic Resort, with its glass igloos complete with saunas; Whitepod Eco-Luxury Hotel in the Swiss Alps, where geodesic dome-rooms blend into the snow but you can order “in-pod” massages; and Treehotel (Harads, Sweden), which is all about “the significance of trees for human beings.” Highlights include architecturally-stunning tree-rooms perched in the Lapland forest and guides who will take you to a safe place deep in the forest, set up a fire, cover you in reindeer skins, and let you experience the beauty and silence alone (although you can always call if you can’t stand the solitude.). The tree house concept is beyond “ascendant,”whether at Costa Rica’s Nayara Springs Resort,where spa treatments are taken on lanais dangling out in the rainforest; the U.K.’s venerable Chewton Glen, where “treetox” retreats take place in their new luxe tree houses; or at Sugar Beach in San Lucia, where every spa treatment room is a tree house hidden in the jungle, and a maze of outdoor walkways emanates from the property tree house cluster. There are nearly as many wildlife guides at spa/wellness properties as there are in national parks. Whether at Costa Rica’s Finca Rosa Blanca Inn, with its on-site naturalist leading guests through the rainforest; or at Puerto Rico’s St. Regis Bahia Resort, with its bird-watching tours in the Caribbean’s only “gold” certified Audubon Sanctuary. Don Camilleri, director of Hospitality and Leisure Concepts and former development director of Center Parcs UK, noted, “Center Parcs resorts’ forest settings create a unique feeling of wellbeing. We don’t necessarily use the term ‘forest bathing’ yet, but it’s a great way to describe the experience guests can enjoy being together and getting closer to nature, while taking a short break from everyday life. At any one time, over 15,000 people are soaking up the forest at one of the five Center Parcs villages in the UK. And our Aqua Sana spas have also been designed to really immerse guests in ‘forest wellness.’” Center Parcs villages certainly hit diverse forest-immersion notes: the spa pools are surrounded by forest, there’s a menu of guided forest walks, and working with Austria’s Schletterer Consult they’ve created innovative Thermal Suites that infuse oxygen and forest-extracted essential oils, salts and minerals into the air so people can “forest bathe” even when it rains. Forest bathing – it may be a poetic concept, but there’s powerful evidence that it’s also medicine for our bodies and mind, offering stress-reducing, immune-boosting benefits that you simply can’t get anywhere else. It’s a uniquely accessible (download one of the many forest finder apps) and perfect practice for our stress-crushed lives, with shinrin-yoku giving people a framework for experiencing the forest in a new way: with intent, mindfully, meditatively, with every sense open. Nature prescriber, Dr. Zarr, has stated7 that the effects of nature are still “not on enough people’s radar,” even though “we’ve touched on something exciting.” Our prediction is that will change, and change will take many forms. That includes the advent of “forest schools”8 – where today’s over-scheduled, screenaddicted young children are moved entirely into nature as their classroom – first established in Swiss Waldkindergartens, and now catching on in places like the U.S., U.K. and Canada. In short, forest therapy will be supported by more governments, promoted and developed in more forests, and incorporated into more wellness/spa retreats. Meanwhile, mounting medical evidence regarding forests’ and green spaces’ impact on human health will continue to lead to innovations in architecture, urban planning, and workplace, hospital, school and home design. And while more people travel to forests in search of health and rejuvenation, experts will find creative ways to bring more green corridors to where more and more of us live: the city. Research undertaken on 600+ subjects by leading forest medicine scholars, Juyoung Lee and Yoshifumi Miyazaki of Chiba University, and Qing Li from Nippon Medical School, Japan. BBC, “Green Spaces Can Save NHS Billions”, 2013. The New York Times, “The Claim: Exposure to Plants and Parks Can Boost Immunity,” 2010. United Nations, World Urbanization Prospects, 2014. Results of global forest tracking from 2000-2012, published in Science, 2013. Outside magazine, “Take Two Hours of Pine Forest and Call Me in the Morning,” November 2012. Slate, “RX: 50 mg. Nature,” July 2014. NPR Radio, KQED, “Forest Kindergartens Push Back Against Academic Focus for Young Kids,” November 2014. My Fitness. My Tribe. My Life.